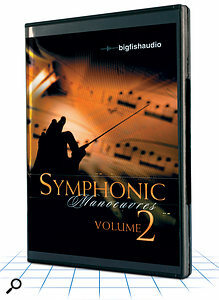 Big Fish Audio's Symphonic Manoeuvres Volume 2 provides 10 orchestral construction kits along with some handy extras. The mood here is 'adventure film' and, as the pieces gallop by, it's easy to imagine yourself being chased across a cornfield by a helicopter, menaced by the powers of darkness, pursued by a headless horseman or other such annoying distractions that tend to disrupt a busy composer's working day. Ably performed by a Czech orchestra, the pieces are between 100 and 120 seconds long and comprise strings, brass, woodwinds and orchestral percussion in both close and distant mikings, augmented by piano, harp, celeste, hand drums and choir. Some synths and programmed drum beats are also included. The orchestral sections were sonically isolated from each other, so if you solo the strings or woodwinds there's no bleed from brass and percussion. Musically, it's all good, loud, rousing, rhythmic and rollicking Mission Impossible/Da Vinci Code stuff, with propulsive military snares, ominous timps and piatti crash cymbals, epic brass tunes, driving string figures, nervy woodwinds and a choir popping up occasionally to warn of the impending arrival of the Antichrist (in Latin, naturally). Most pieces have a minor‑key feel, stick to a tonal centre and introduce tension via chromatic melodic movement; imagine the main theme of Holst's 'Mars, the Bringer of War' or the brass top line in the James Bond theme intro and you'd be in the right ballpark. Unlike the recent crop of 'cinematic' releases, there are no other‑worldly, creepy, CSI‑style soundscapes; the library sticks to a symphonic sound palette and a musical agenda that speaks of heroism and danger. The orchestral extras consist of 30 samples of stabs, stings and all‑purpose big dramatic endings, including a few ending builds that feature some great histrionic eruptions. In addition, the Greek choir sing 'aah' chords of various types in a choice of three keys (I guess there wasn't time to cover the other nine). One singer tends to start notes late and wobble a bit in pitch, but you probably won't notice that in the mix.